In stark contrast to the industrial feel of Ingraham St, a smell that undeniably belongs to smoked meat wafts out of Terra Firma. It’s a transportive welcome to the space, which opened in late 2015 inside what used to house Brooklyn Fire Proof East Cafe (artist studios remain upstairs). The restaurant serves breakfast lunch and dinner, seeking to maintain the former cafe clientele while their inventive dinner menu highlights Nashville-bred chef Chris Sterna. 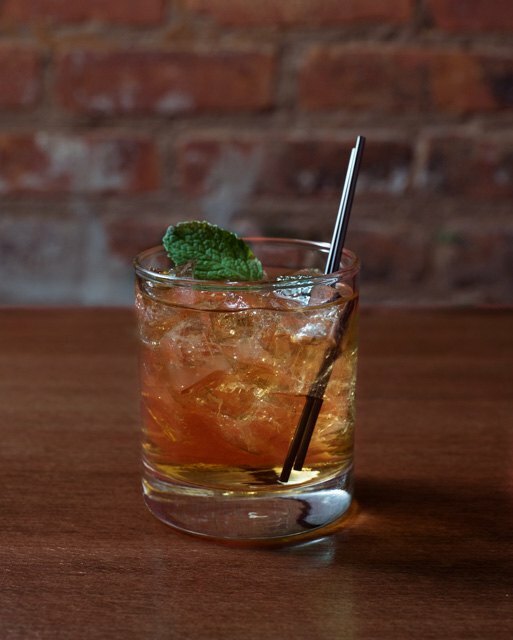 With its fully stocked bar, Terra Firma is a welcome addition to this pocket of the neighborhood, which continues to see the opening of new galleries and workspaces while remaining neglected in the culinary department. Owners Darrin Morda and Tom Beaulieu felt particularly drawn to the aesthetic of the neighborhood after moving to Bed-Stuy from Boston. Standard cafe fare dominates breakfast and lunch; think Greek Yogurt with House Granola, an assortment of sandwiches, salads and locally roasted Devocion coffee. Sterna’s Southern roots shine in the dinner menu, reflecting the owners' idea that “We really wanted to give him full reign over the menu and creativity.” There are twists on classic Southern dishes: think beignets stuffed with crab meat or gruyere in the biscuits. What qualifies as twists on the recipes’ Southernness complements rather than overpowers. For starters, we suggest the biscuits appetizer. 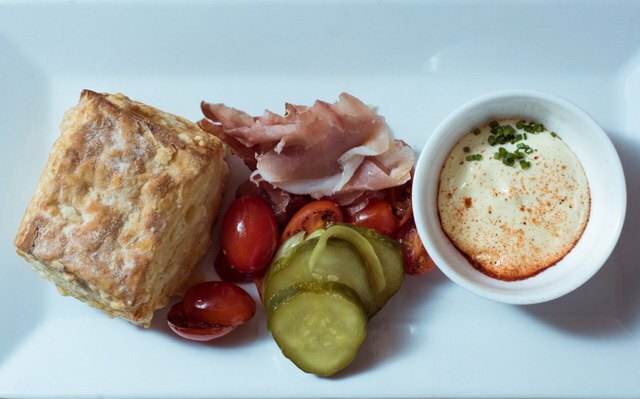 A spin on your classic ham biscuit, it’s served with speck, tomato, aioli, homemade pickles. Tomato and pickles cut the saltiness of the delicious speck and tart aioli may make you question using plain mayo ever gain. The biscuits are dense and doughy in the center, very thick, and crisp on the outside without sacrificing any of its interior doughiness. Oh, and they’re made with Romano and Gruyere, which could be too rich if not balanced so perfectly. Sterna’s crab and corn beignets make your wonder why these aren’t as much of a “thing” in NYC. Crab and corn inside make for a lovely spin on a New Orleans classic. Aioli, rogue blue, cilantro and lime complement the fluffy fried dough. Other standouts include the brisket, smoked in house and responsible for the olfactory bliss I experienced on Ingraham. Thanks to the intensive smoking, for which the chef arrives at hours one typically only sees if they’ve stayed up a bit too late, the brisket falls apart in on the fork. 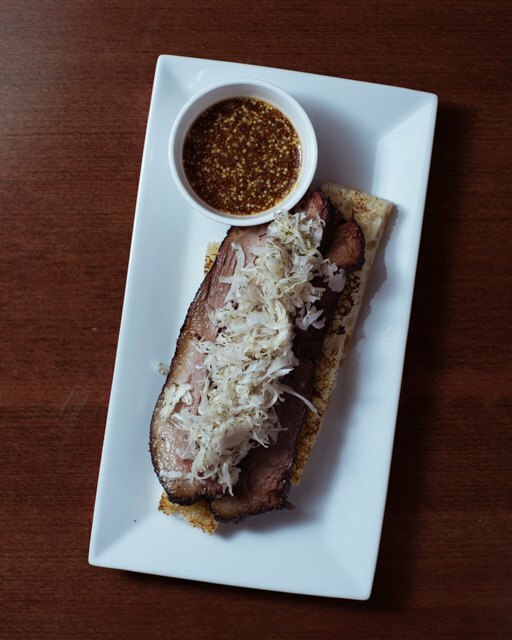 Topped with Serrano pickled cabbage and stout mustard, this is one of those appetizers one might consider for your main course. 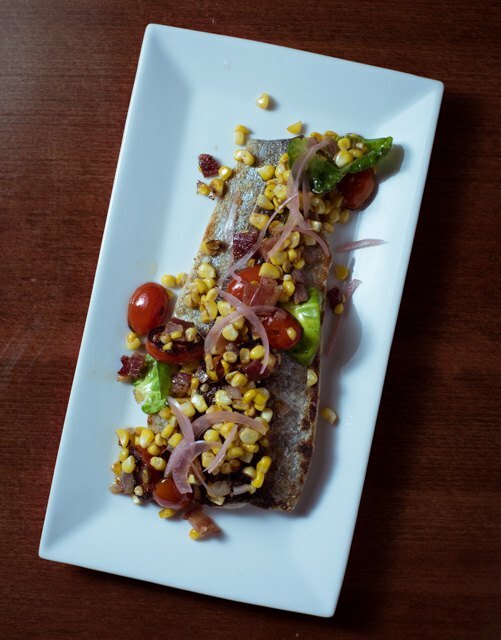 Trout topped with succotash and tomato. For mains, we recommend the trout. Served atop white bean puree which tastes like healthier mashed potatoes, the dish follows Terra Firma’s leanings towards larger portions. Succotash and tomato pair nicely and the succotash benefits from the unlikely addition of brussels sprouts fragments. Should you feel more gluttonous the skirt steak (served with those gruyere biscuits, cippolini, brussels, parsnip, walnut glaze and jus) is a no-brainer. 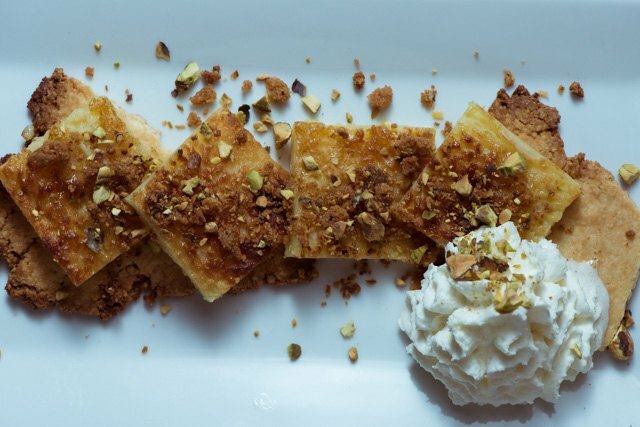 Buttermilk pie is a deconstructed pistachio confection served with bourbon whipped cream rounds out a decadent evening. Even if overwhelmed by the richness of previous courses, this is pretty impossible to resist. A promise that the menu will change seasonally means Sterna will continue to innovate on his Southern-inspired recipes, and we look forward to seeing how that evolves. Pie deconstructed and topped with bourbon whipped cream, worth every calorie. Many places attempt southern food, sometimes resulting in things that are off-kilter instead of innovative. Terra Firma stands out in its ability spin classic dishes that make you wonder why they weren’t that way in the first place. Shoutout to the Agavoni, your "Mezcal Negroni" made with Vida Mezcal, Campari, Carpano Antica Sweet Vermouth. 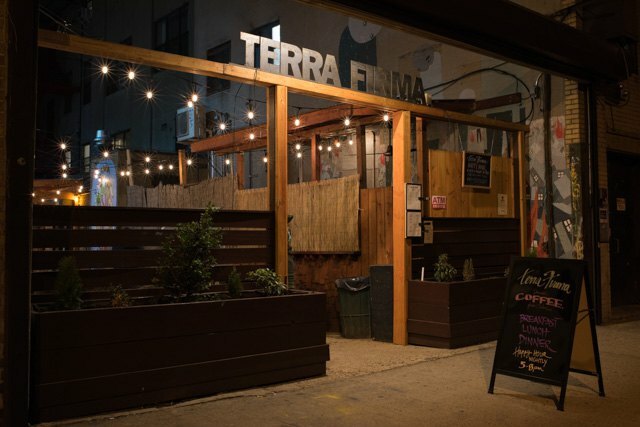 Terra Firma, 119 Ingraham St, East Williamsburg, Hours: Mon-Wed 9AM-10PM, Thu-Fri 9AM-2AM, Sat 11AM-2AM, closed on Sundays. Full menu is here.